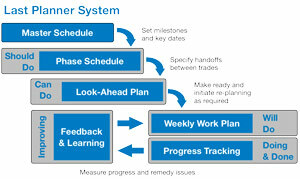 The Lean Construction Institute defines the Last Planner System® as a production planning system designed to produce predictable work flow and rapid learning in programming, design, construction and commissioning of projects. Whatever definition you use, it should include a key phrase: measurably effective. Learning (measuring percent of plan complete (PPC), deep dive into reasons for failure, developing and implementing lessons learned).